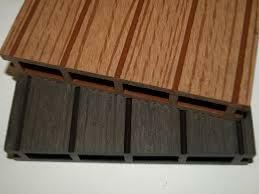 Natural plastic composite deck boards supplied in 4.8 mtr lengths. Manufactured using a 60% wood 40% polymer mix, this double sided deck board has a traditional lined face and a wood grain patterned side. 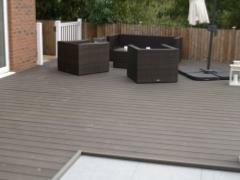 The material offers a greater resistance to rotting and is more slip resistant than wood whilst retaining a natural appearance that will age and fade gradually but needs no preservative treatment, staining or coating.